If you would like to make something sophisticated, yet rustic, this project is definitely for you. It's the perfect place for necklaces, especially simple ones. To make this jewelry tree, you will need to locate some of the nicest branches that you can. Paint them with a gold or silver color – a glitter spray would be beautiful. Place these branches into a vase and arrange them so that it almost looks as if it is a tree. You can then hang some of your lighter necklaces on the branches. It will hold quite a few, and you may be able to throw one or two larger necklaces on there. You can even add some bracelets and rings to the ends. As you are placing your necklaces, just pay attention to how the branches are holding up to make sure you don't put too much on them, which can take away from the whole design and eventually lead to the breaking of the branches. If you want something a bit flashy, but you don't want to take up a lot of room, you may want to consider this DIY craft. You will need a piece of circular corkboard, some glitter (your color choice), empty tape rolls, paint (your choice of color) and spray or craft adhesive. Paint the empty tape rolls (painter's tape or duct tape) inside and out. Spray your adhesive across the entire piece of corkboard (you could also use hot glue for the tape rolls). Attach the empty tape rolls in a pattern of your choosing and spread out the glitter evenly across the corkboard. That's it! You can place bracelets, rings, etc. inside. It can also serve as a message center, so make sure you keep a couple of thumb tacks handy for attach notes. If you're looking for a stylish, vintage-themed way of storing your jewelry, consider heading to a local thrift store and seeing if you can find some old shutters. You can likely find some pretty easily, and for a small price. 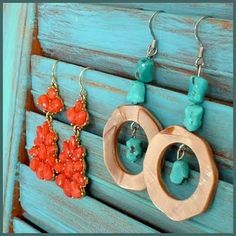 You can take these home, paint them a color that matches the décor in the area where you plan to affix it to the wall, and hang your earrings. If you add some small hooks, you can also store your necklaces, bracelets and rings here as well. If you find that you have room for additional jewelry, head to your local jewelry store to feed your addiction!